As soon as I saw the pink cover of the #digitaldetox journal, I knew that we were going to be together forever. Exactly the same feeling the first time I clapped eyes on Tom Hiddleston...TOGETHER FOREVER. The journal and I have just been on holiday together, something that Tom and I have not quite managed. Something to do with the restraining order, I think. Anyway, less of Tom and more of the journals! 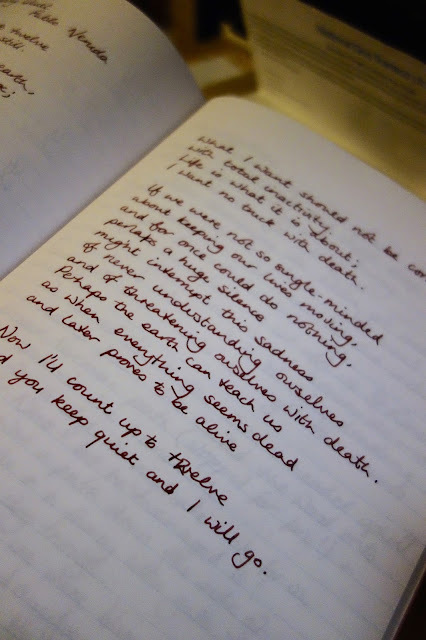 My handwriting is large and loopy (a bit like myself) and I've quickly discovered that small journals are not my friend. By the time I'm about halfway down the page, my writing is scraggly because my hand is no longer resting on the page. SO, my #digitaldetox journal was ordered up as a respectable Post Quarto size of 17cm x 24cm (or 6.5" x 9.5" if you still work in old money). And other sizes are available! 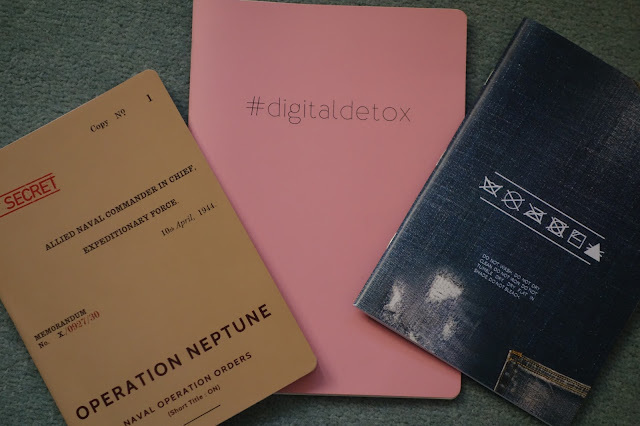 The #digital detox journal comes in a choice of pink or natural, but Rob has the most marvellous selection of covers that you will find something that makes you smile. For example: one has a spidy on it, another is an old ration book cover, there are roses, ribbons, birds ... even a map. But if none of the covers suit you YOU CAN DESIGN YOUR OWN using the site's built in software. So if your bridesmaids feel that you need a 'Bridezilla' in a crazy font, picked out in gold, against a white background, it can be YOURS! Covers aren't the only choice available - the paper can be plain, ruled, dot grid or séyès (remember the weirdly lined letters that your French pen pal used to send you? That's séyès). And yes, it has taken me a good 10 minutes how to figure out how to type those accents in that word. The journals are all made in the UK and the paper is finest Fedrigoni uncoated 85gsm. Fedrigoni UK source all their materials from suppliers who practise responsible environmental policies. That's a big selling point for me! As far as the quality of the paper goes, while I'm no expert, I can promise you that there is no ink bleed through when using a fountain pen and it felt lovely to write on. There is a tiny amount of show through, but not enough to prevent you from comfortably writing on the other side of the paper - and I was using Diamine Oxblood, which is quite dark. I would say that it takes about 20 seconds from writing (with a Cross as a test pen and also a Jinhao) for absolutely no smearing at all if you pass your hand over your work. Minimal smearing at 15 seconds to be honest. My advice is just stay sober and don't drag your hand over your fountain pen handwriting and this will never be a problem, 'nkay? My #digitaldetox journal came with me for a week's holiday to Innerleithan in the Scottish Borders where I religiously recorded everything that we did whilst on our family holiday. The first time I've actually managed to do that for EVERY day of a break. The wit of having the journal called #digitaldetox (after all, hand-writing is the epitome of digitally detoxing!) gave me pleasure every time I hauled it out of my bag. And don't forget to take a close look at the 'washing instructions' on the denim notebook!! The journals are 52 pages which I have found absolutely ample for all projects undertaken so far. Desirability? Can I just say that I have to keep retrieving my Operation Neptune journal from my son's desk and that I keep on ordering more from Rob than a respectable woman really should? 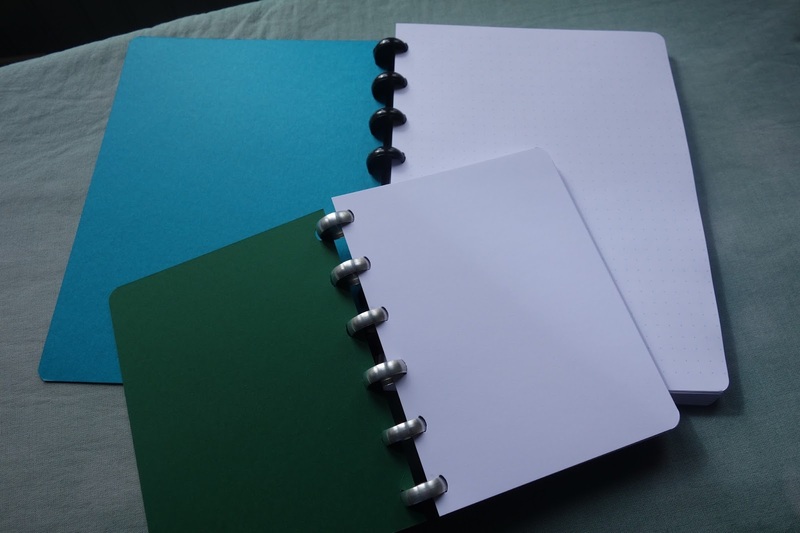 Stand by for a review of the brand spanky new ARC-style disk journals that are being produced! more of these two another day!